Dhaka, Dec 16 (Just News): BNP on Saturday alleged that the government has taken all-out measures to restore one-party rule obliterating democracy. "Democracy is now totally deported from the country. People's all rights have been snatched. 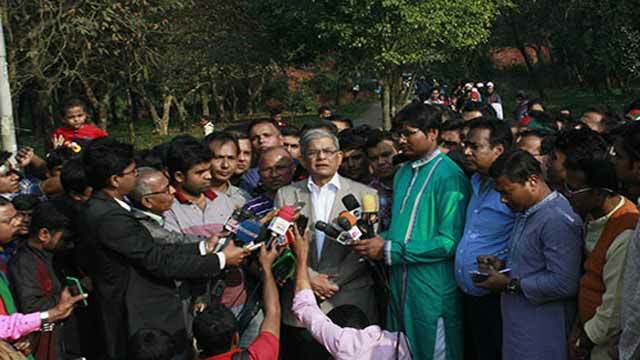 They now can't independently express their opinions while journalists can't dare write the truth," said BNP secretary general Mirza Fakhrul Islam Alamgir also alleging that the people lost their personal securities as the government is ruling the country "unlawfully and unethically,". Talking to reporters after placing wreaths at BNP founder Ziaur Rahman's grave marking the Victory Day, he further alleged of government's move towards establishing one-party rule and said, "We've taken a vow under the leadership of Khaleda Zia to continue our movement for democracy until we achieve our desired target." Fakhrul said BNP is making its best efforts in carrying out democratic movement in a democratic manner despite repressive acts by the government. About Awami League general secretary Obaidul Quader's comment that people will turn down BNP in the next polls, Fakhrul said it is the people, who will decided which party will govern the country provided they get chance to cast their votes in a fair and credible election under a non-party administration. "We'll accept the people's verdict in such polls." Earlier, BNP Chairperson Khaleda Zia, flanked by her party senior leaders, placed wreaths at the National Mausoleum in Savar around 11am, marking the 47th Victory Day. BNP secretary general Mirza Fakhrul Islam Alamgir, senior joint secretary general party senior leaders Ruhul Kabir Rizvi, standing committee member Dr Abdul Moyeen Khan, and vice chairman Amanullah Aman were, among others, present. Later, the BNP chief drove straight to the grave of BNP founder Ziaur Rahman at Sher-e-Banglanagar in the capital where she along with her party leaders and activists placed wreaths. Fakhrul alleged that their chairperson was obstructed at different points on her way to Savar and return to Zia's grave.